Being a ninja is awesome, but having to wear all that heavy black shinobi garb can feel a bit cumbersome (and not to mention hot in the summer)! 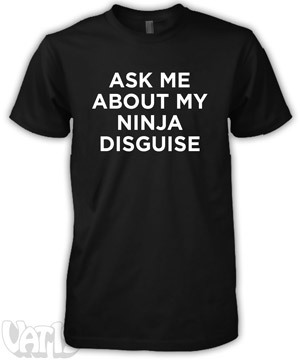 With the "Ask Me About My Ninja Disguise" T-Shirt, you can switch in and out of ninjutsu attire with a simple flip of the shirt. The lightweight, 100% pre-shrunk cotton features a pitch-perfect ninja disguise on the inside and an invitation to the show on the outside. I freakin' double-karate-chop dare you to ask me about my ninja disguise! 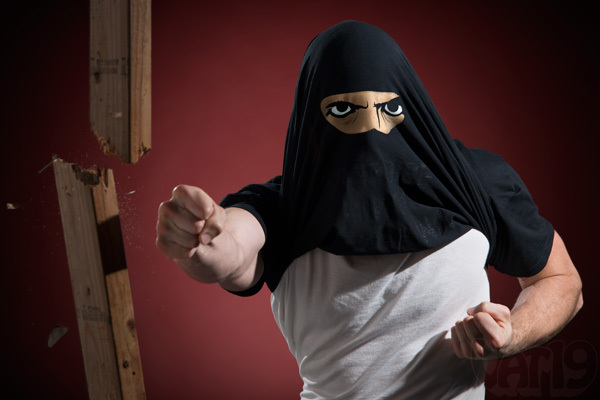 Ninjas are super stealthy. So stealthy, in fact, that they're already in your house, hovering behind you, and prepared to chop off your face if you don't order this shirt. And in case you're wondering about the logistics of deploying ninjas to the house of every person visiting our site, worry not. We simply have that many ninjas at our disposal. What can I say? They like our pencils. They will ask. And when they do, you'll be prepared to strike. So often an awesome t-shirt design is ruined by printing it onto the equivalent of tissue paper. Not at Vat19! Every shirt we sell is always soft, comfortable, and more than capable of handling a lifetime of trips through the washing machine. 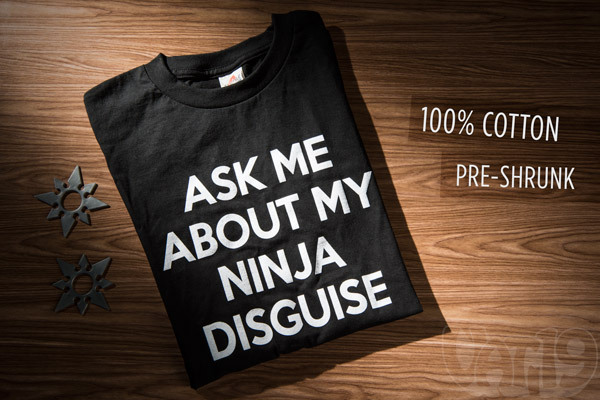 Therefore, it should come as no surprise that the "Ask Me About My Ninja Disguise" T-Shirt is a durable, high-quality, pre-shrunk 100% cotton cloak of comfort. 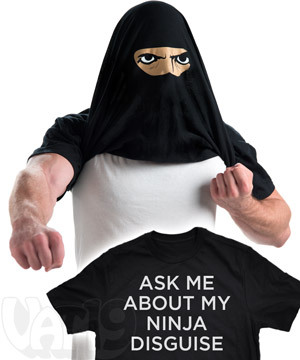 You'll stay comfy and cool when rocking this flip-up ninja t-shirt. Now go forth and be ninja! 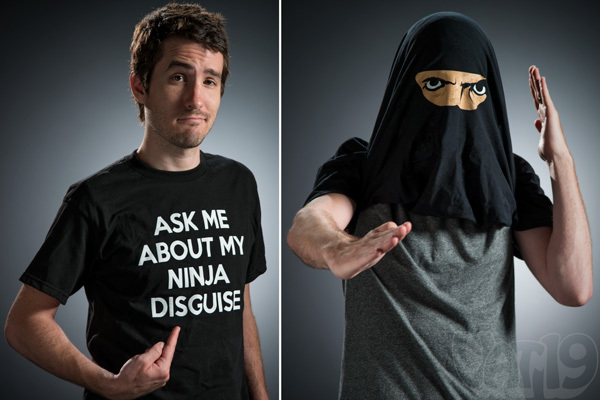 Without the "Ask Me About My Ninja Disguise" T-Shirt, can you possibly punch through a 2-by-4? Perhaps. But I'm sure as heck not going to risk a broken hand on improper costume. Are you? Trust us, you do not want to see the hand of the guy who wasn't wearing the shirt. It isn't pretty.